Rottweiler is known as one of the best guardian dog breeds. In its early days the breed was better known for protecting cattle instead of land or people. 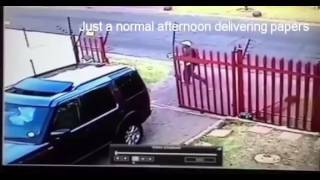 In this video posted by the owner of a Rottweiler, you can see the protective nature of the Rottweiler, but in this case the dog missunderstands the situation attacking the mailman because the dog recognised the situation as a hijacking one. I agree with good dog!!! But that guy was busy putting mail into the post box. No "potential" hi jacking situation. Look at the video again and you will see it. But still think its awesome the way he protects his family! Well done good dog!! !